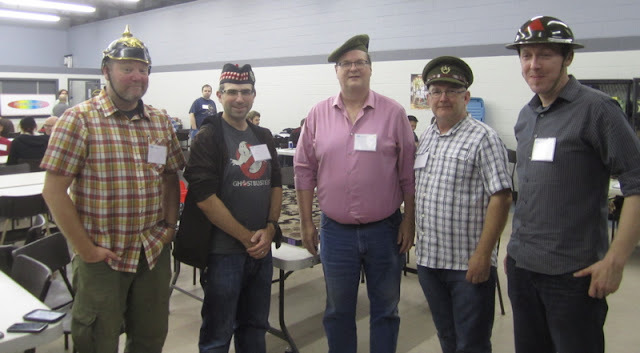 This past weekend was ToonCon 2016 - our local game convention. 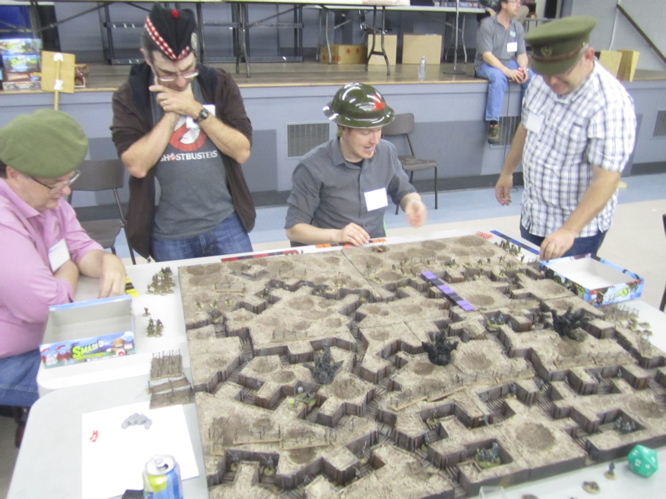 It’s really become mostly a board game convention, but I try to roll out with a miniatures game every year. This year I planned an event I called REGINA TRENCH! (you can read more about the whys and wherefores are the link). The game focused on the First Canadian Division's actions at the Battle of Theipval Ridge which commenced on 26 September 1916 – 100 years ago this week. 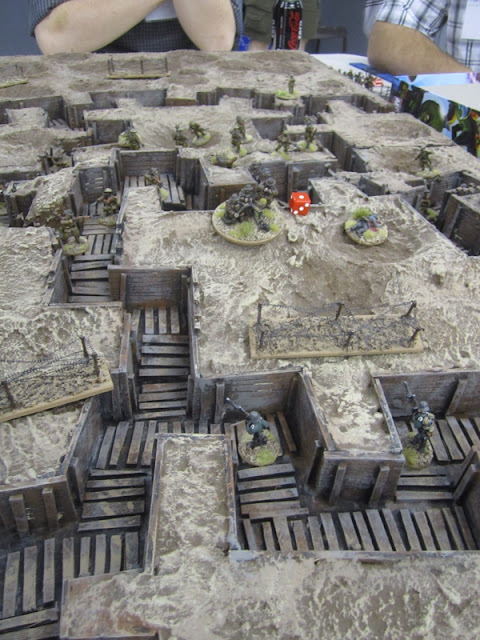 Four players would each command one of the assault battalions or the two brigades of the division that were involved – each of the brigades also had a supporting battalion that was to follow up and help hold the trenches taken against counter attacks. Preceding the Canadian advance was a creeping barrage that would first hit “no man’s land’ (to try and cut the wire) and then successively hit the three lines of trenches – mostly to keep the Germans heads down and get the Canadians onto their objectives without being shot to bits by rifles and machine-gun fire. 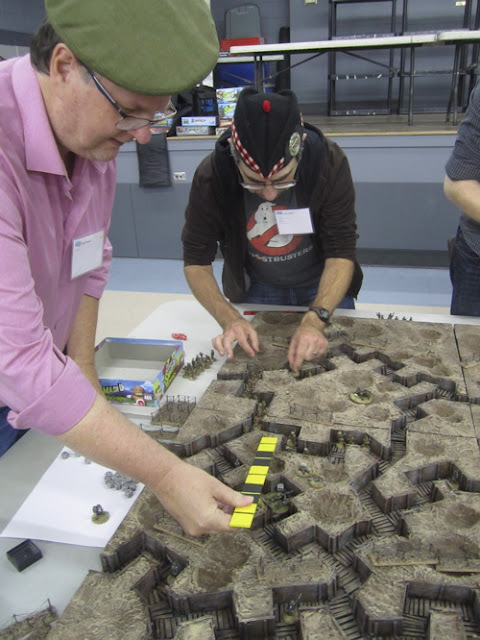 Because there has to be a “winner” for each event at ToonCon – to whom prizes are awarded – but this was essentially a co-operative game, I came up with a simple victory point system. 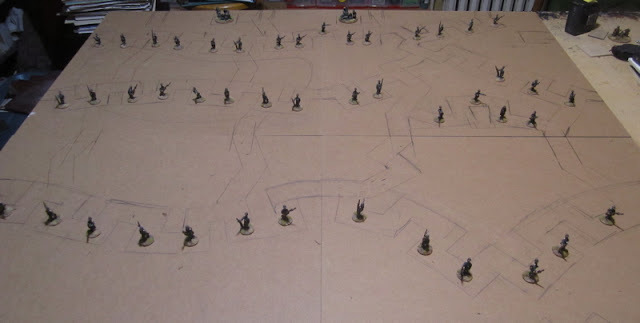 Basically however many men each player had left of their original battalion multiplied by how many trench lines the successfully captured was how many “victory points” they’d have and whoever had the most would “win”! Firstest with the mostest, I guess. 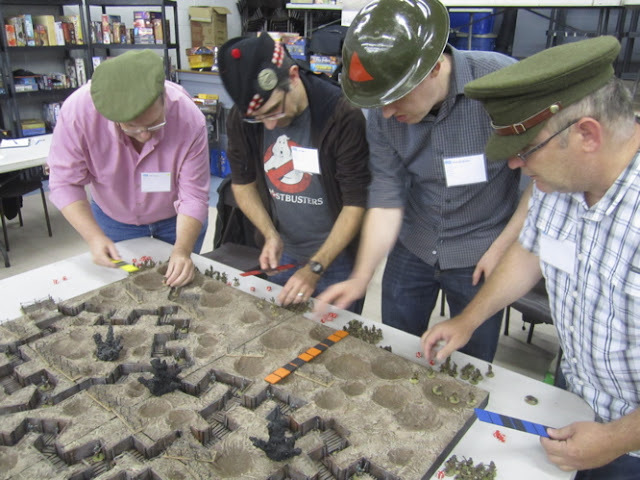 I had the most fabulous participants for the game – they really got into it! On the right of the picture is Roch (in the Service Dress Cap) who commanded the 8th Battalion (90th Winnipeg Rifles) (which was on the extreme left of the line). 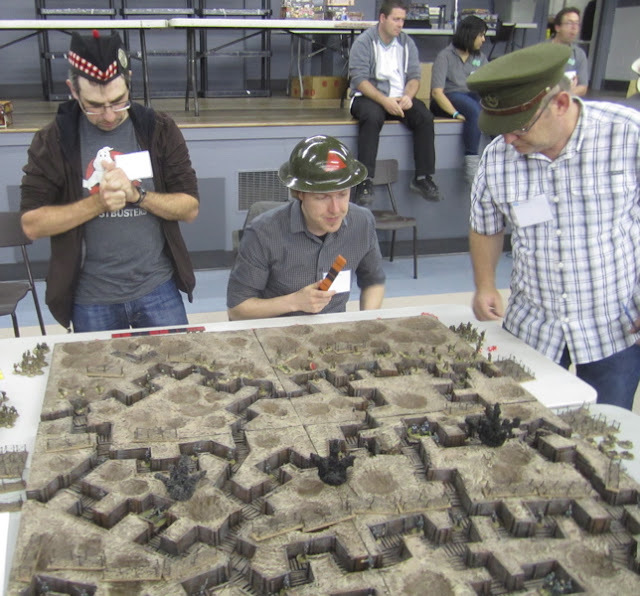 Next to him was Brennan (in the helmet – I know, I know… it’s a WW2 helmet…) who commanded the 5th Battalion (Western Cavalry) the other assault battalion from the 2nd Infantry Brigade. Together they sort of shared command of the 10th Battalion - the supporting battalion for the 2nd Canadian Infantry Brigade – and the 2nd Canadian Machine-gun Company. 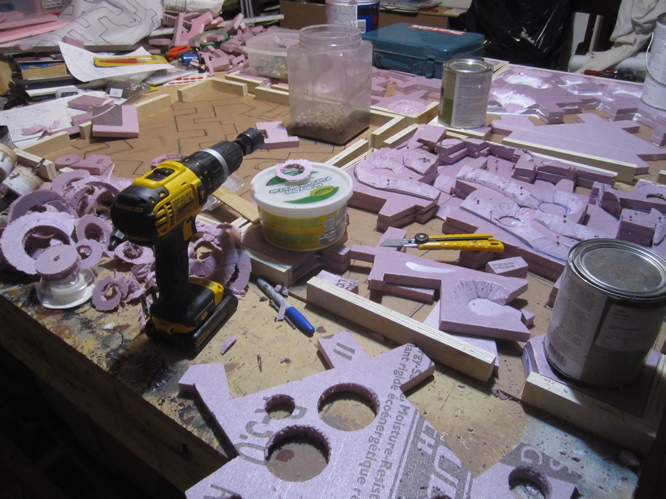 There was a LOT of other people that wandered by the table to see what was going on. The barrage commences – hoping to cut some of that wire in “no man’s land”. 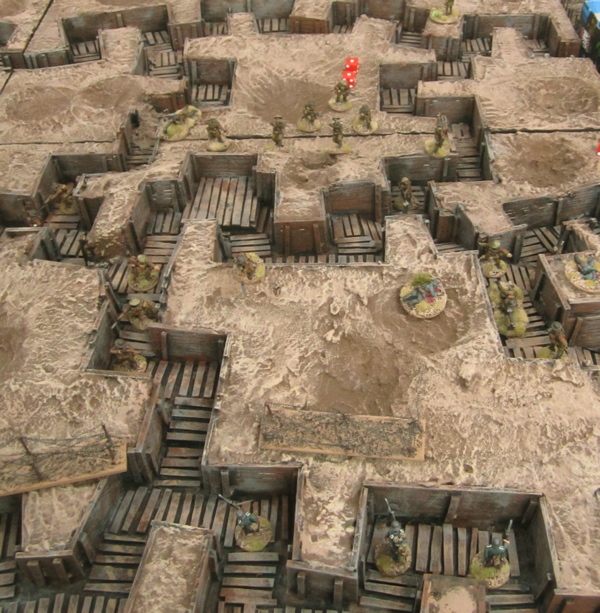 Once the barrage lifted to the trench line the Canadians began their advance! 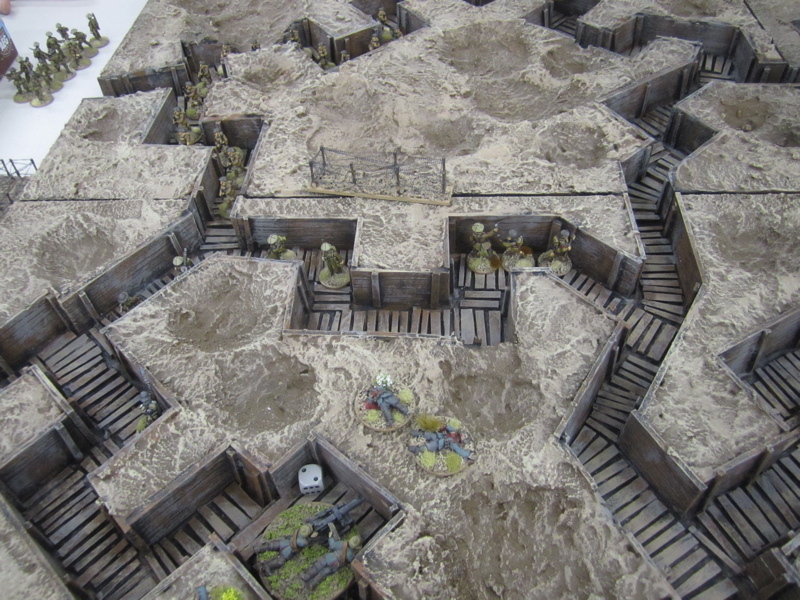 Bob’s 14th Battalion got hit particularly hard – on 15 dice I hit on 5+ which, statistically should have carried off 5 of his lads – I managed to roll EIGHT fives and sixes instantly dropping him to half strength! OUCH! The brave lads from Montreal pressed on, however! 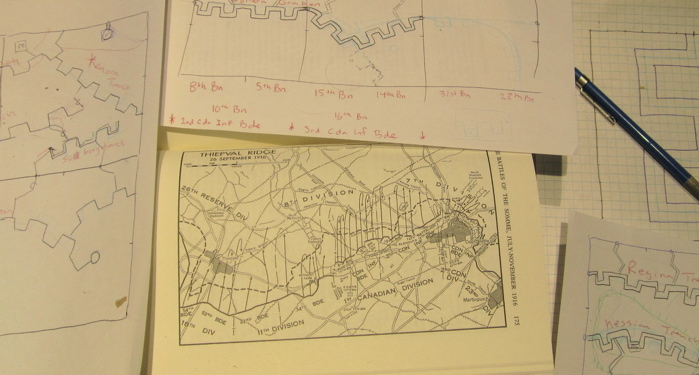 This would have been turn five as the barrage lifted to the second line and the Canadians fell on the defenders of the First trench line. This looks like some of John’s 15th Battalion (48th Highlanders) falling in on the Germans in the front line trenches! 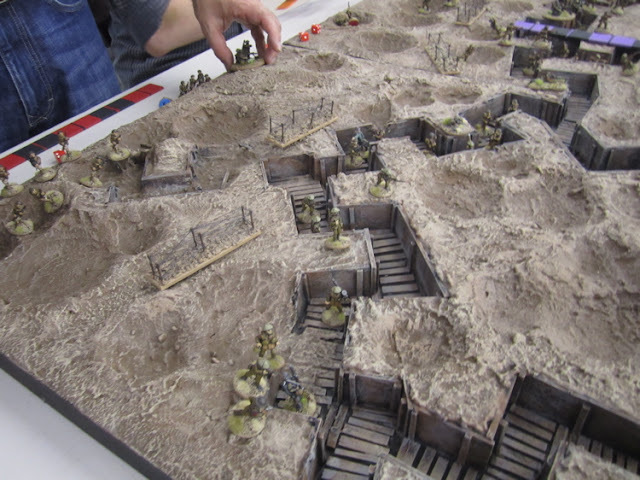 The 5th and 8th Battalions of the 2nd Infantry Brigade hit the frontline trenches! Casualties started mounting as the Germans desperately tried to hold onto Zollern Graben – the first trench line! 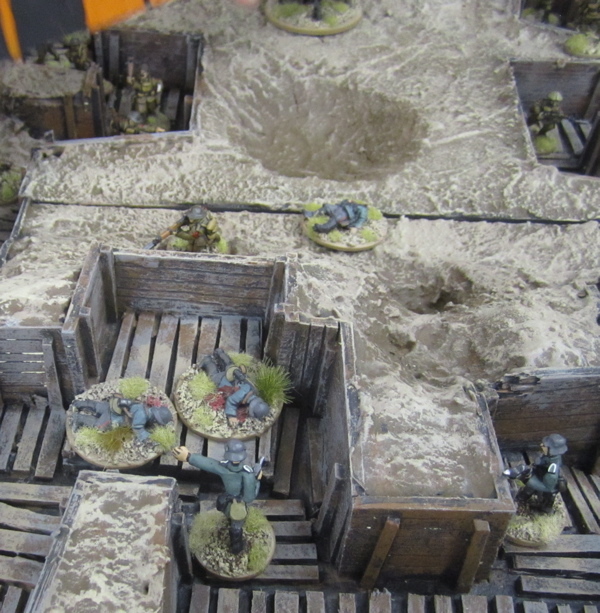 Canadian barrage continuing to pound the second line – but all too soon it would lift and get away from them! The Remnants of the 14th clear out the last of the German resistance in Zollern Graben – the first line of trenches was completely captured! 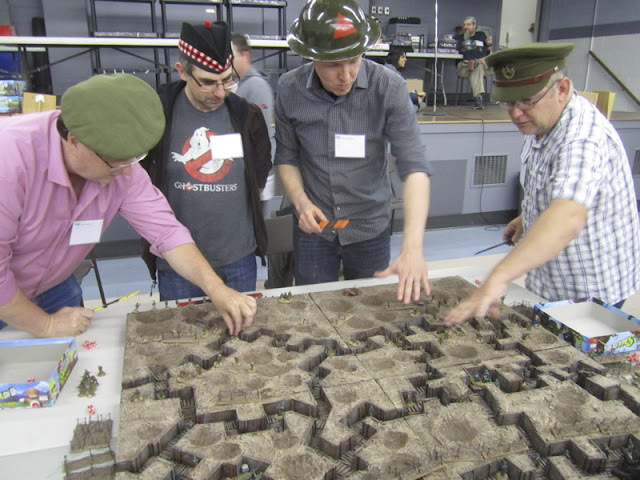 Looks like the 16th Battalion (Canadian Scottish) are moving up to support the depleted 14th. 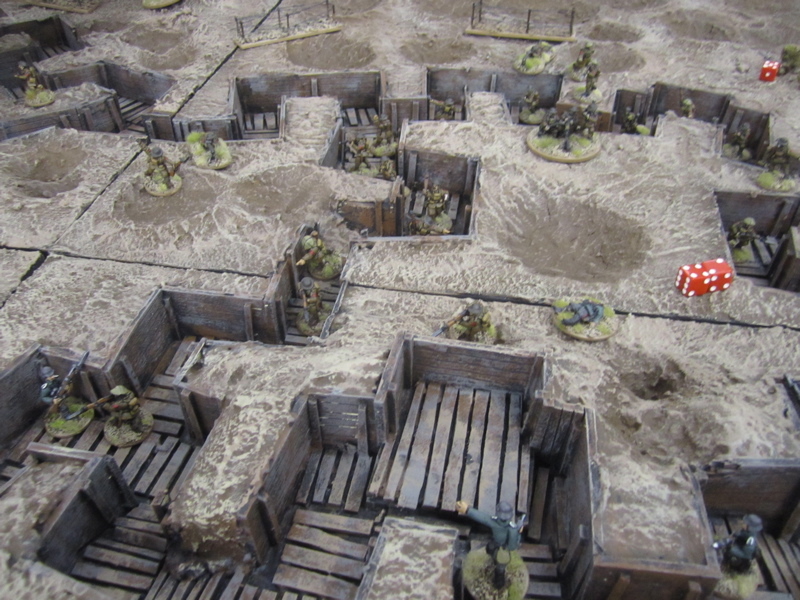 The 2nd Canadian Infantry Brigade again – with their supporting battalion (the 10th) moving up to help consolidate the trench the assaulting battalions are just capturing. …Or.. in some cases, not so much… The 2nd Canadian Machine-gun Company must have been recruited from the Divisional Track and field team because they sprinted across “no man’s land” and past the first trench, set up their guns while taking fire from the German machine guns – who were shooting like Imperial Stormtroopers ( I just could not hit them!) and then massacred the German Machine-gunners with some insanely precision machine-gunning!? I think someone really wanted to bring a Victoria Cross home to show their sweetheart! 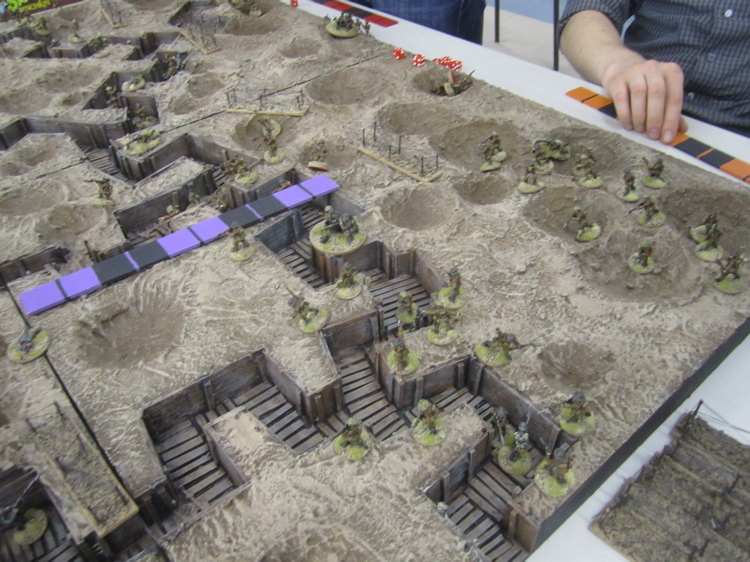 With the machine-guns cleared on the 2nd Brigades axis of advance, Hessian Trench was all but clear for the taking! John striking a martial pose! The remnants of the 14th and 15th Battalions capture Sudbury Trench – the second trench line on the 3rd Brigades line of advance. But they could go no further – both were down to about ¼ strength. Remember that Machine-gun/sniper/track and field team I mentioned earlier… yeah, AFTER storming across “no man’s land”, setting up their guns in the open under fire and wiping out the Germans machine team in their trenches, they picked up again and sprinted up and over the hill and set up just beyond the second line of trenches and started machine-gunning the Germans in Regina Trench! Eventually their luck would run out and they were cut to ribbons by the Germans holding Regina Trench. The 3rd Brigade Assault battalions exchange (mostly) ineffective fire with the Germans still holding Kenora Trench. 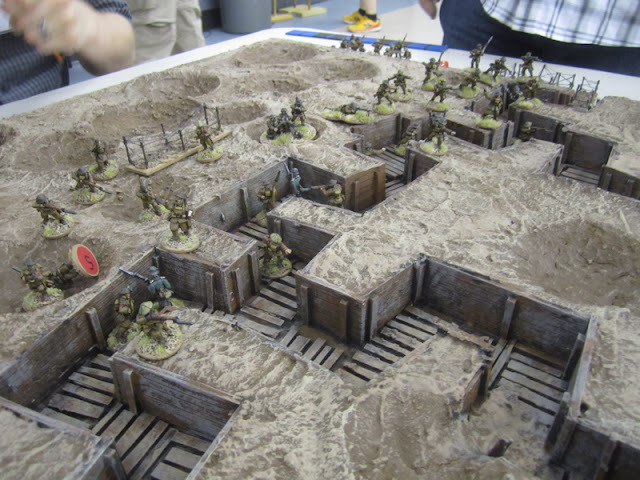 The 2nd Brigade captured Hessian Trench and might have advanced further if time had allowed – but their ranks were getting pretty thinned as well! As all battalions captured the second line trenches – their main objective for the day – it came down to who had the most troops left. I think the 8th, 14th and 15th battalions had been whittled down to 3-4 figures (of their initial 15) – but Brennan’s 5th Battalion (Western Cavalry) - hearty prairie boys from Saskatchewan! – had 7 left – so he was declared the winner! 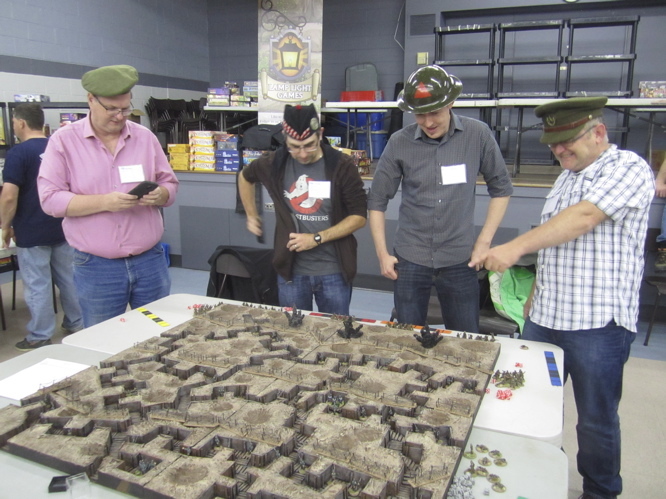 The lot of us – from left to right; me (in the pickelhaube - I actually had to wear the chinstrap throughout the game because otherwise it would have fallen off my head onto the table with disastrous results! ), John, Bob, Roch, and Brennan. 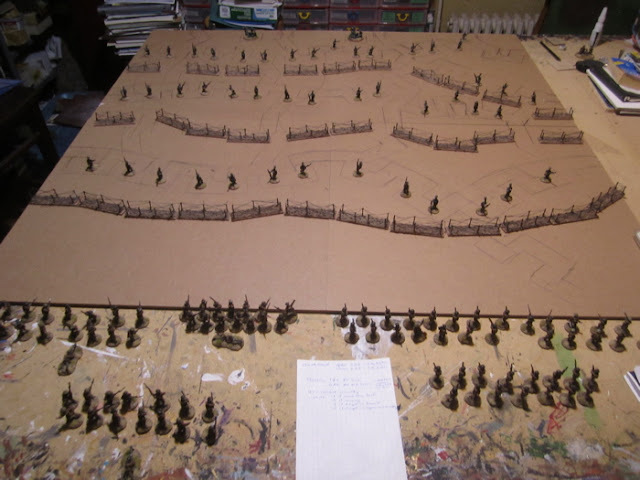 Hopefully I'll be able to get all these guys out for the Vimy game in April! 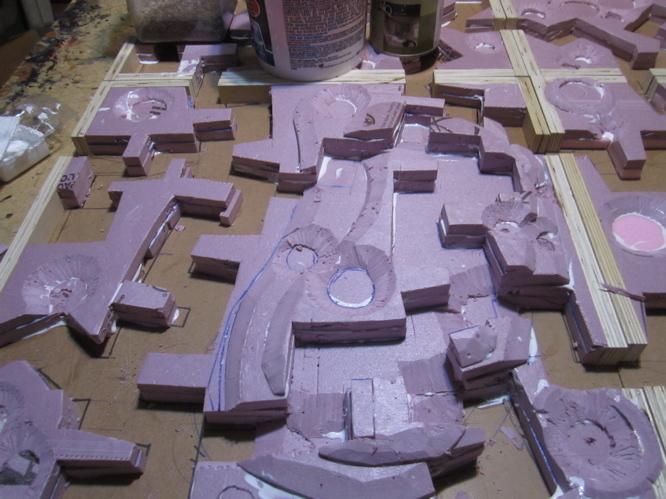 Well.. if I learned anything from the last week, it’s that I need to get working on the Vimy Terrain NOW! 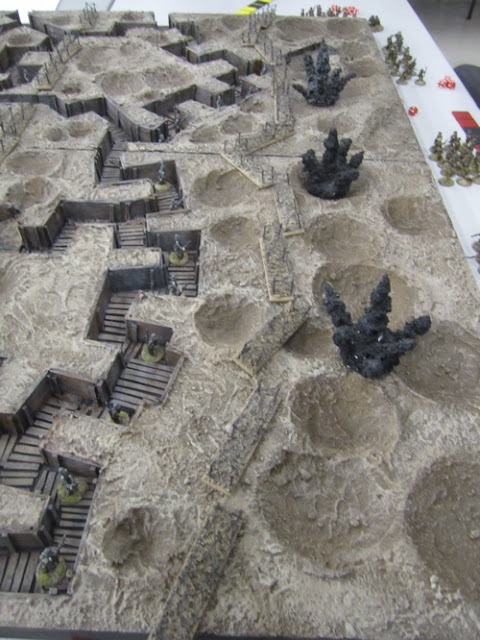 For further inspiration I would HIGHLY recommend checking out Sidney Roundwood’s blog, click on the Trench Terrain label and bask in the glory of his magnificently beautiful miniature Great War battlefields! The most time-consuming part of this whole process what simply cleaning up the War Room to a state where I could actually… you know… WORK on building some new terrain! 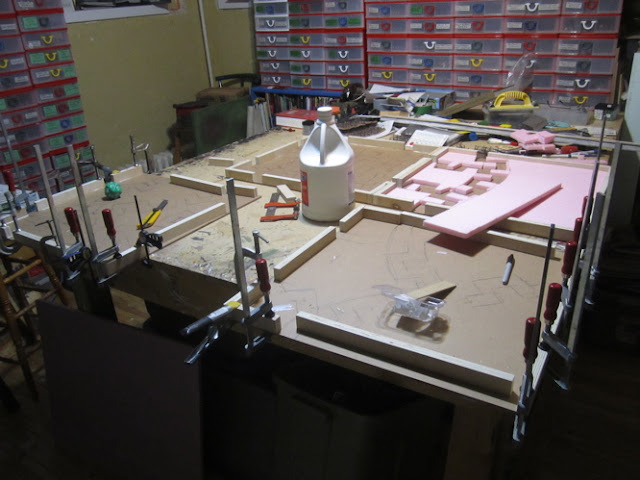 Three years ago we went through some extensive renovations to our house, during which all the stuff from the second floor was boxed up (rather haphazardly at times!) 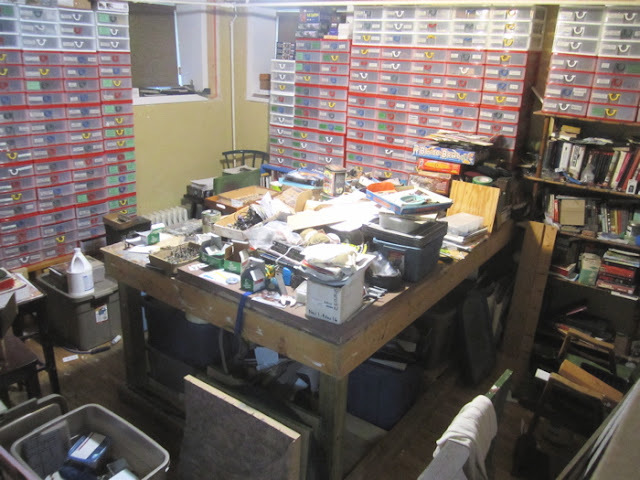 and crammed into the basement. The basement has yet to recover. In fact that basement is rather like a Rubik’s Cube at this point. 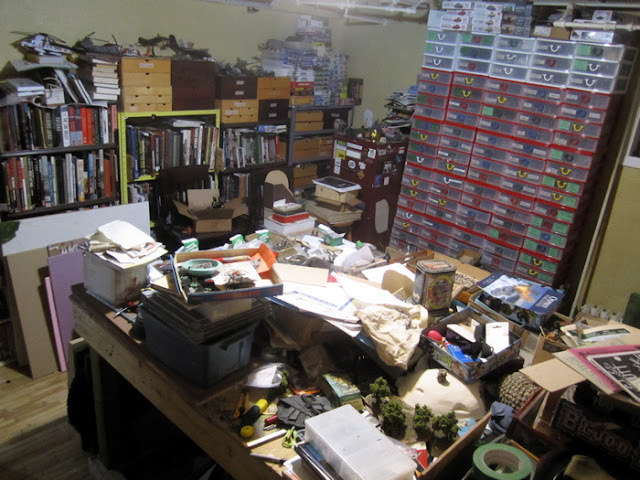 It is so full of stuff to put something somewhere requires displacing something else! So I needed to do some purging. And I did. A bit. I could do with some more. 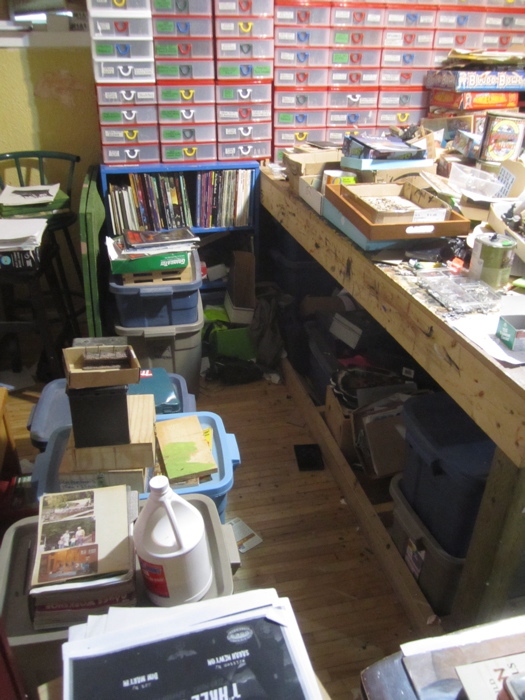 But I’ve cleared enough space that I could do some work – and some actual GAMING in the basement! 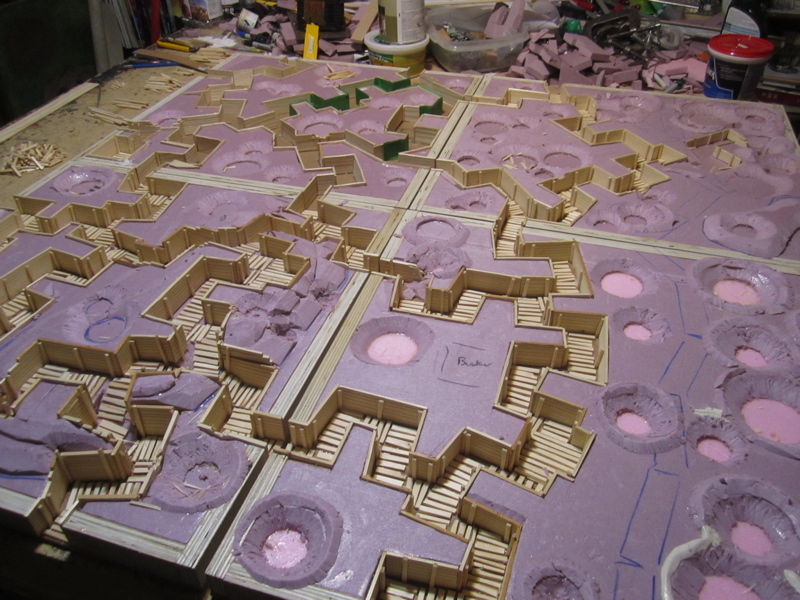 I also got to work on planning the terrain I was going to build. I had two sort of concurrent goals with this terrain. 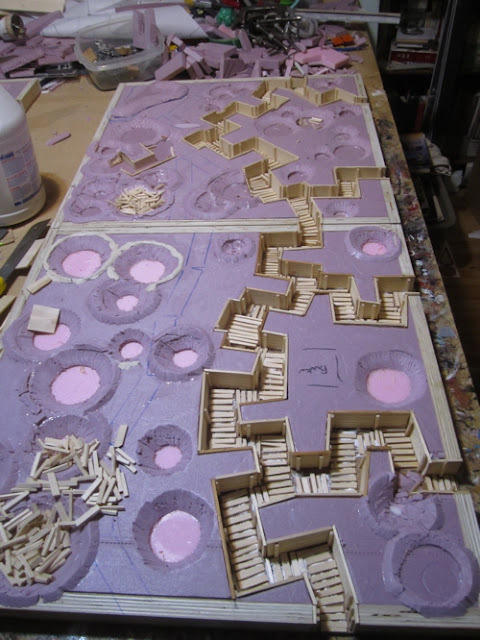 I wanted to make the terrain that roughly represented the battlefield the Canadians fought across, but I also wanted to make it generic enough – and MODULAR – so it could be used for other things. 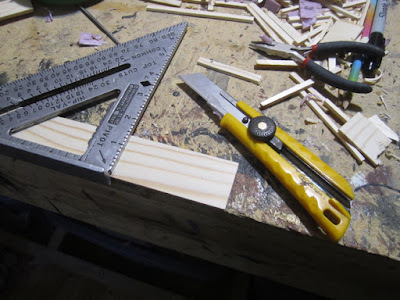 I’d cut four 600mm x 600mm x 5m MDF boards for other terrain projects some time ago – which saved me having to go rummaging through the garage to find one of my larger sheets to cut up (or head off to the hardware store to get some more!). 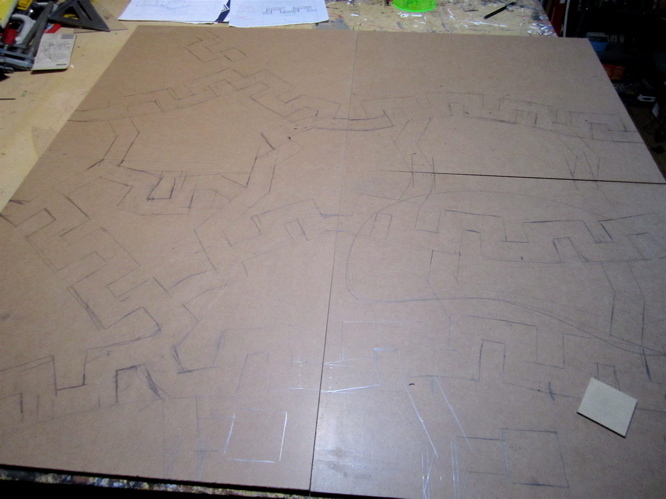 On these I started roughly marking out where the trenches were going to go. The four boards from the north (German) side looking towards the Canadian jumping off line. Setting out the Germans to see how many I’d need to defend these lines. 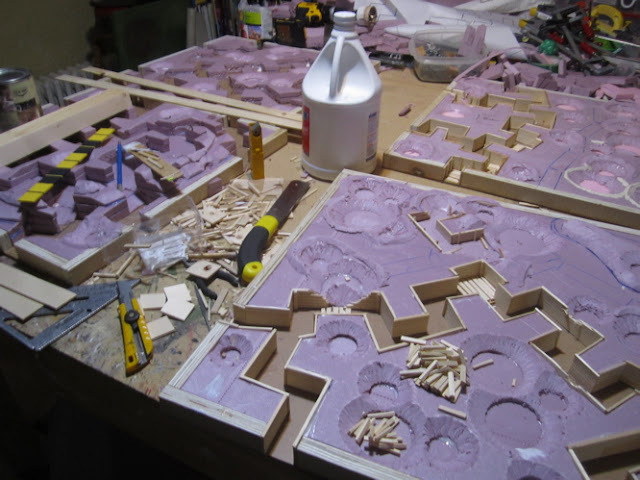 Setting out all the forces for a bit of a play-test on the boards – before I started actually making any of the actual terrain – to make sure it was going to work out. 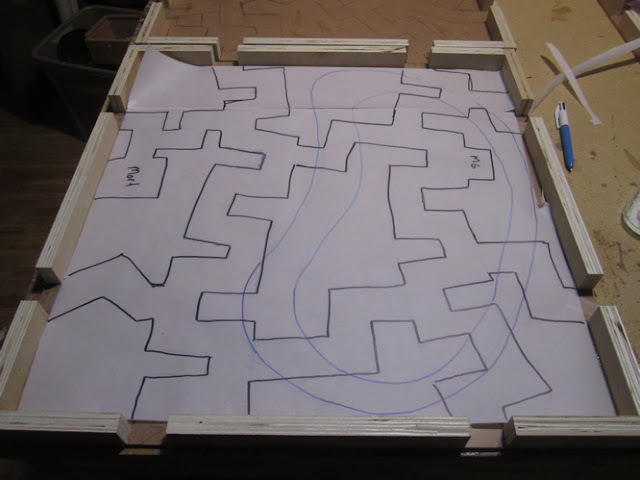 There are a few more pictures of the play-test at the end of the September Challenge Part Two post. 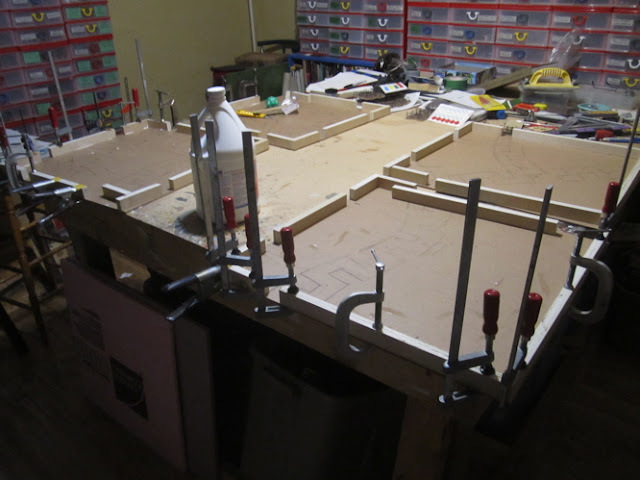 The playtest being a success (in a way…) I started gluing up the boards – to the boards I affixed 30mm strips of 3/4” Finished Plywood. They were 30mm deep because I was using 2 layers of 15mm Extruded Polystyrene to fill them with and create the battlefield over which the miniatures would fight! 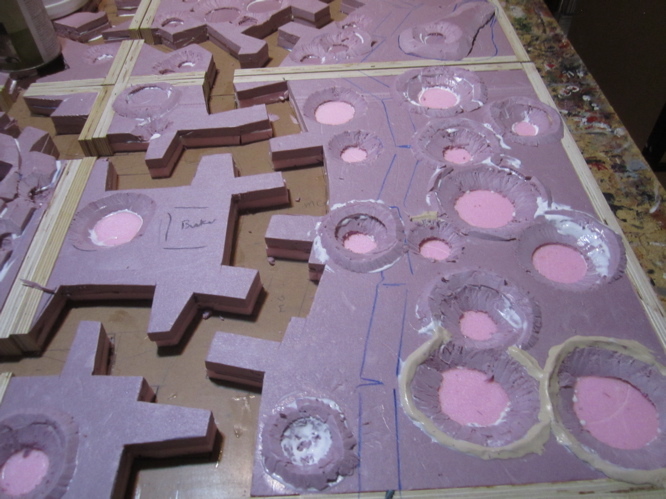 More gluing and starting to cut the polystyrene. Now the problem I realized at this point was that it was all very good to have the trench lines drawn out nice and neatly on the boards – but how was I to transfer this to the polystyrene I needed to cut. 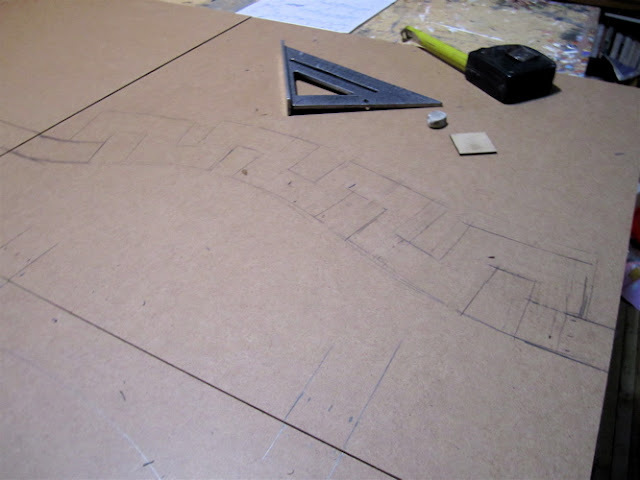 As luck would have it I went a rummaging through the rubbish in the basement and came out with some Staedler drafting vellum that I’ve had for… oh… 20+ years…? 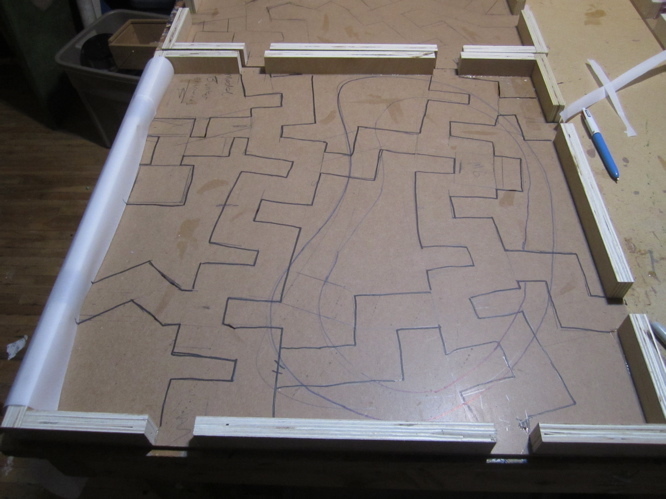 I used that to trace the lines I’d drawn on the boards and then – like a sewing pattern – marked those lines out in the polystyrene. 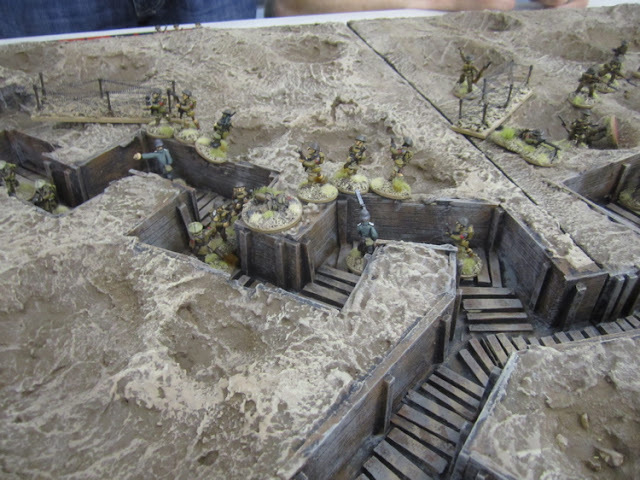 The hill was the trickiest bit – requiring steps within the trenches. Which means the WHOLE of the Vimy terrain is going to be rather tricky! 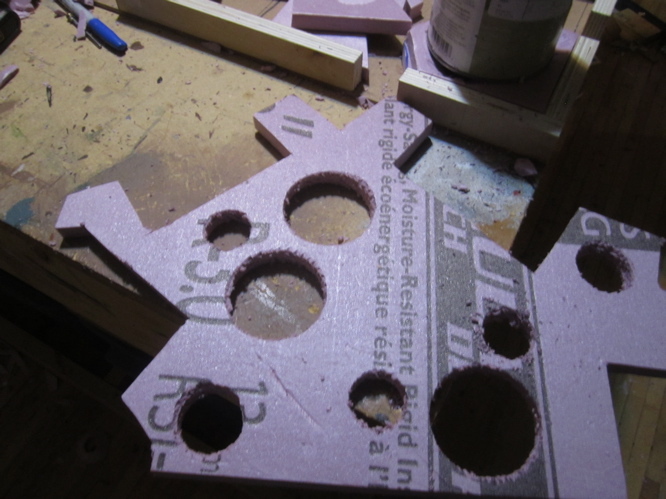 Started making shell holes by very slowly and carefully drilling through the top layer of polystyrene with various sized hole saws in my new-ish cordless drill. Making a right big mess. More details of the shell holes. The hill with its steps and stuff. 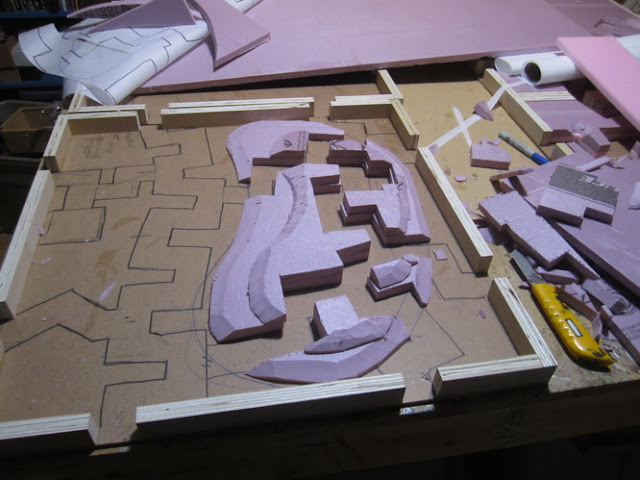 I’d really left this to the last minute – but over the last weekend I’d made a plan and I thought I’d be able to stick to it. 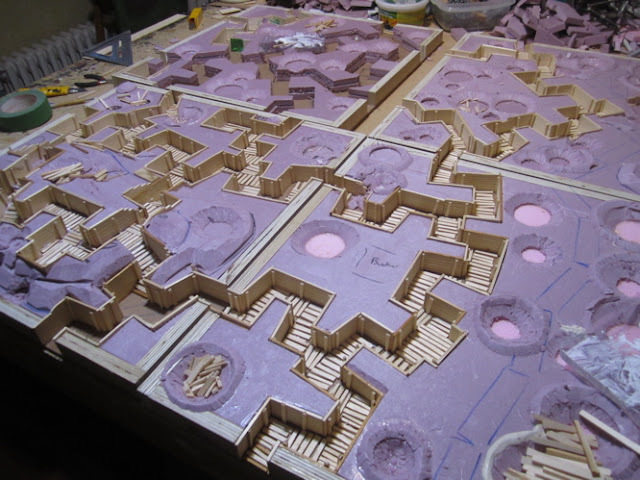 Luckily I have a fairly flexible schedule and I was able to devote an entire week to doing pretty much nothing other than wokring on the terrain. 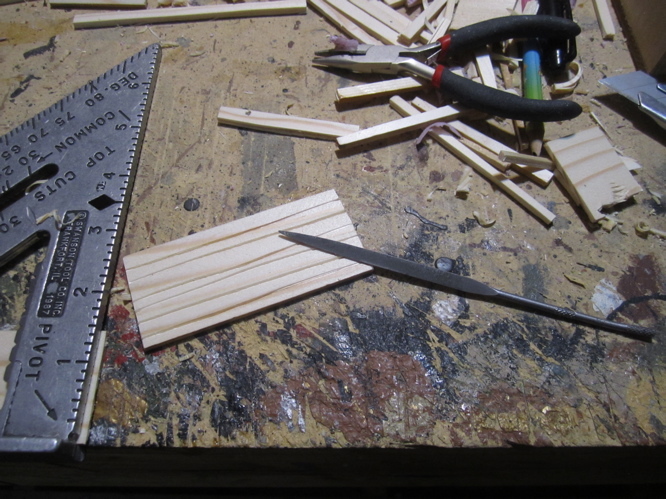 I had gotten the battens glued up on the Saturday – before and after going out the the Saskatoon Comic and Entertainment Expo with The Boy. On Sunday I was to get all the cutting and gluing down of the Polystyrene done – which I did – I think I even started on a bit of the revetting and duck-boards Sunday evening. 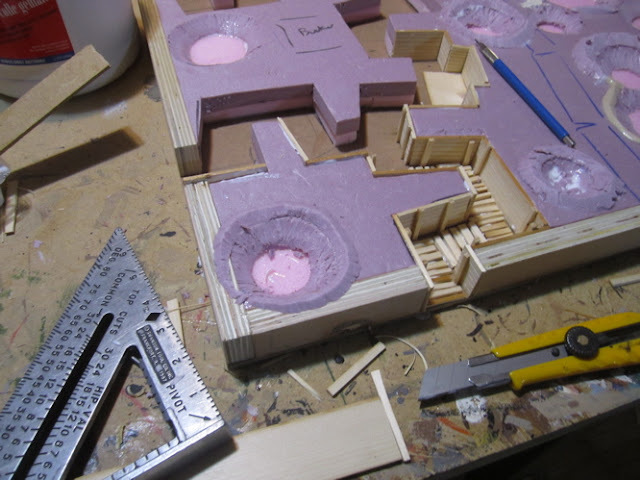 The plan was to complete the revetting and duckboards on Monday. Goop the whole mess on Tuesday. 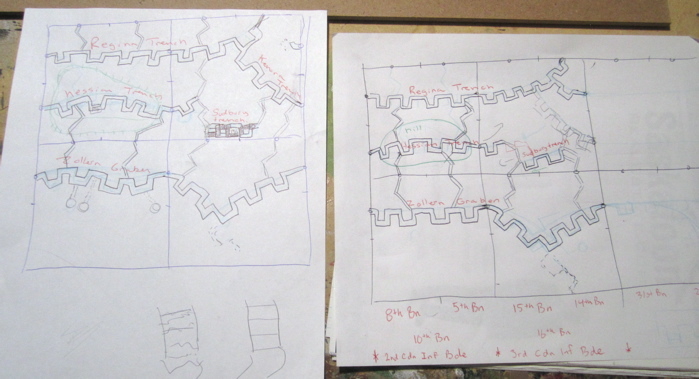 Make all the sandbags along the parapets on Wednesday. And have Thursday and Friday, if necessary, to finish up with the painting. That didn’t quite work out. The making of the revetting and duckboards turned out to take a LOT longer than I’d anticipated. 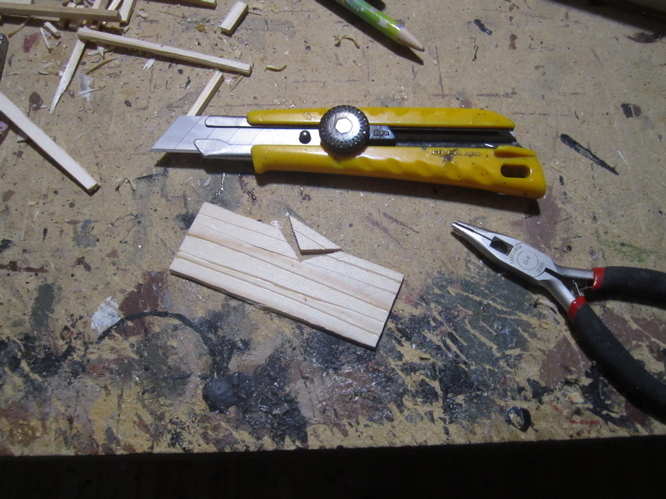 Cutting up bits for duckboards. 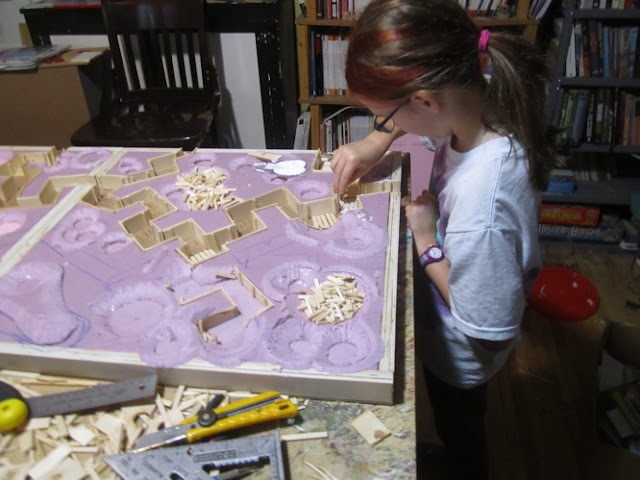 I recruited The Girl to help out with the gluing of the duckboards while I worked ahead on the revetting. 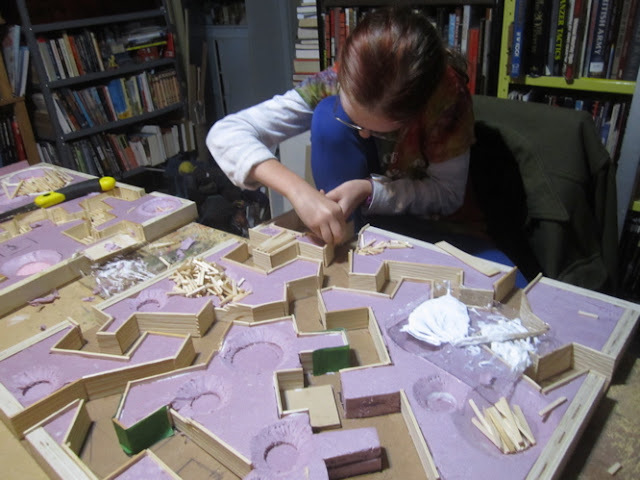 She LOVES working on crafty-projects of all sorts – especially modeling and terrain projects and jumped at the opportunity. I have to give her a big thatnks at this point, because there is no way I would have gotten it all done on time without her help! Working on the hill on Tuesday. 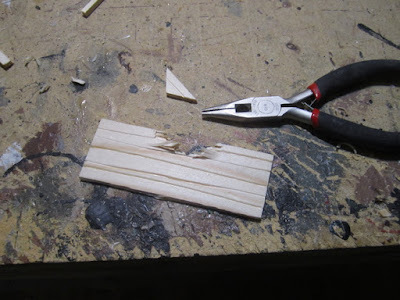 How I was doing the revetting – I made it out of 1/8” strips of spruce I’d cut from scrap 2x4s on a tablesaw (the shavings produced by all this cutting I also use as grass on other terrain boards!). 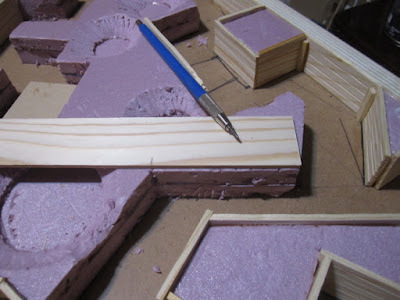 First I measure the section that I needed. Then I would score the strip with the pointy end of a fine file I had to make it look like individual boards once it was painted. Then it was glued into place with Weldbond. 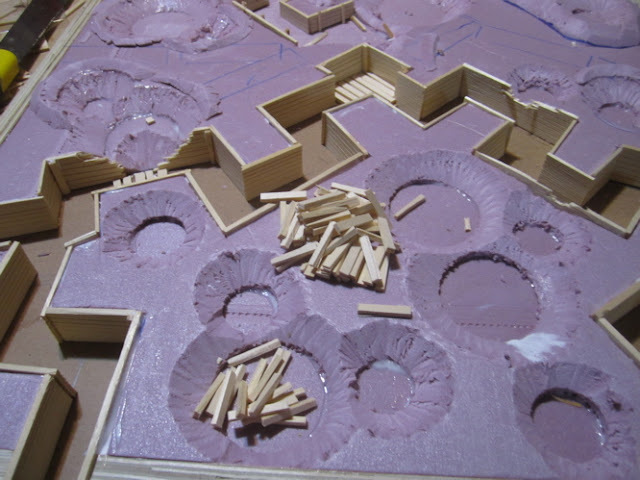 For areas that were adjacent to shellholes I would roughly measure out the area that would have been blasted out by the explosion and cut that out with a knife. Then carefully pull apart and tear bits away to make it look like it had been blasted apart. 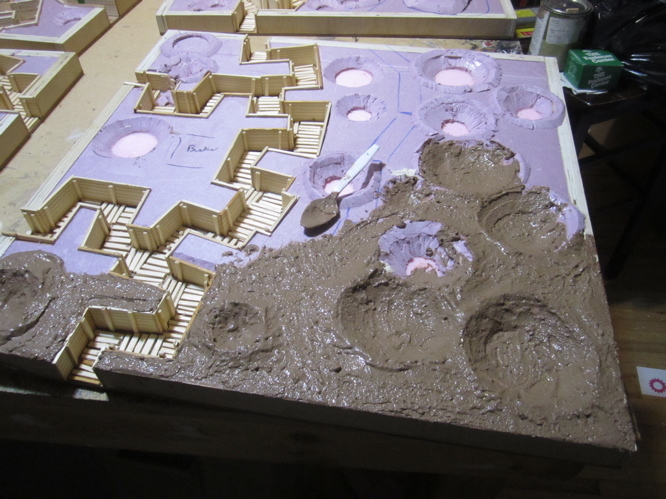 Then glued in next to the crater. The girl helping with more duckboards on Wednesday as I finished up the last of the revetting. 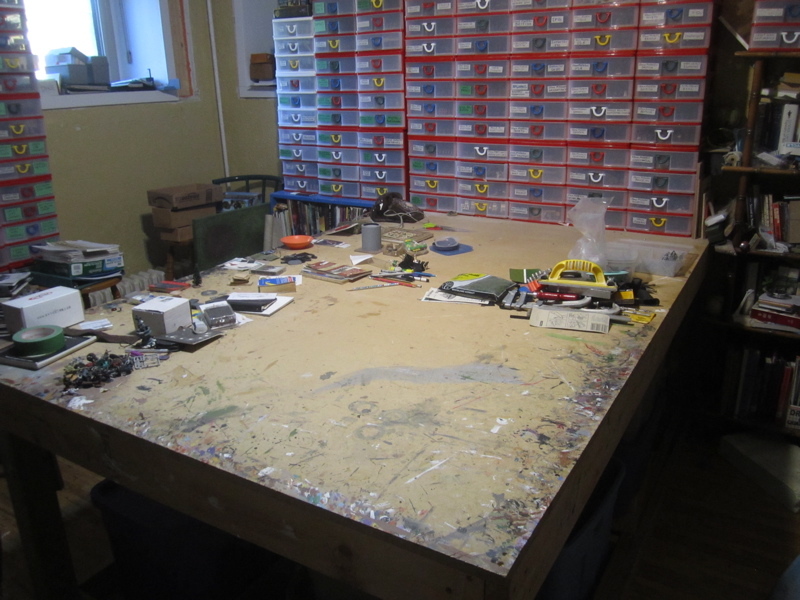 Revetting complete – just a few more duckboards to go in. So it was time to do some GOOPING. 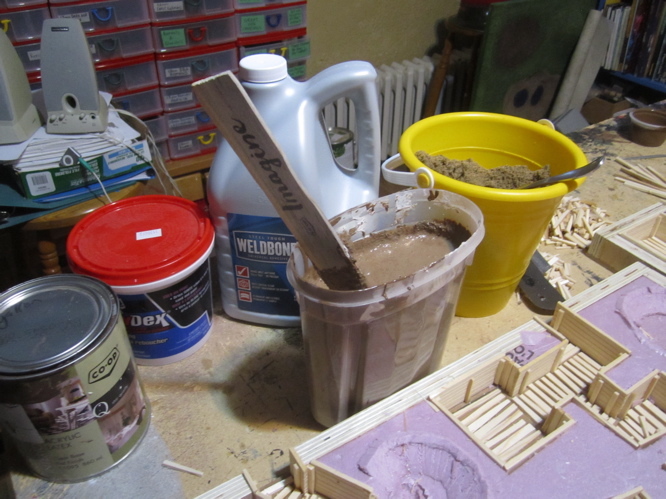 The goop was a mixture of Weldbond carpenter’s glue, some filler product, flat brown acrylic laytex paint and sand. As I went on I used less and less of the filler product and just put in more sand – which is pretty much what I used to goop bases of miniatures. 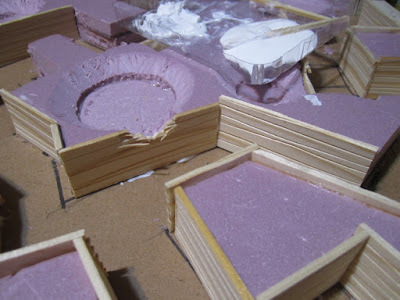 It creates a very hard – almost concrete like product when fully cured. Gooping. This was probably Wednesday evening…?The week ended up being a bit of a blur! 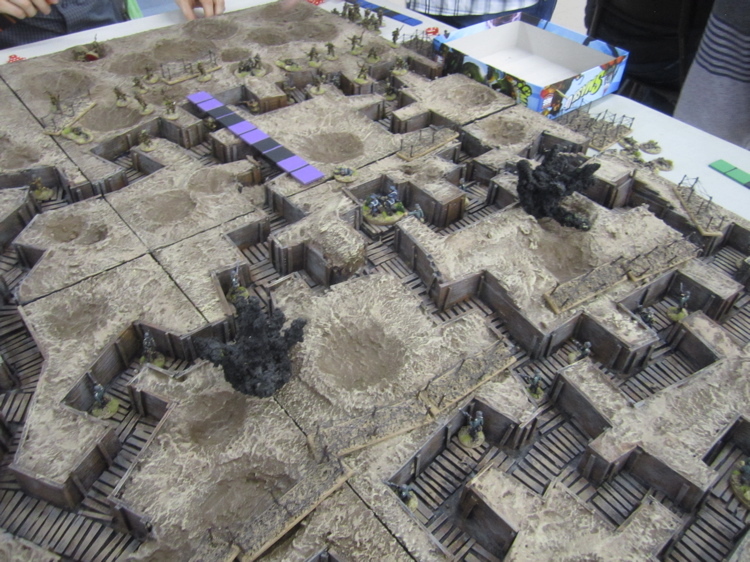 And after it was all gooped I painted the whole trench with flat black acrylic latex paint. And that’s apparently the last of the pictures I took. After the black paint I drybrushed on successive layers of dark brown, then lighter brown, then grey (for weathering) and then blotches of the muddy brown on the duckboards – to look like mud tracked about by troops walking over them. 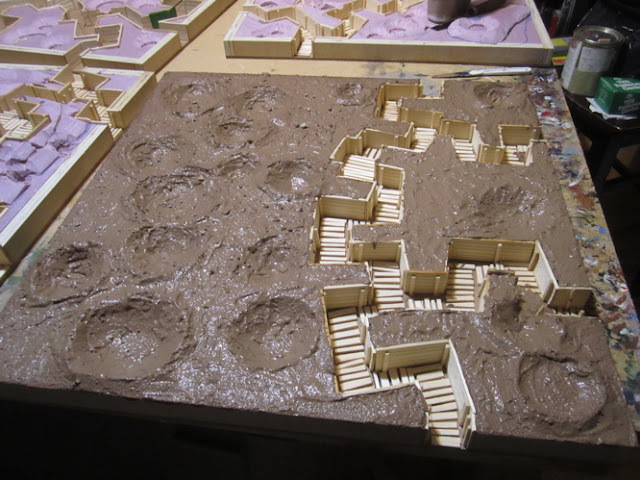 The ground I touched up with the same dark brown I used in the goop mmixture to cover anything that hadn’t been fully covered by the goop. Then drybrushed with successive layers of lighter browns. I had hoped to add grassy areas between the trenches and shell holes – especially towards the rear of the defensive lines. But I just didn’t get to that… I had also hoped to line all the parapets – at least of the fire trenches – with sandbags and build up the areas around the MG emplacements and maybe model some bunker entrances into the sides of the trenches… but that just didn’t happen either. 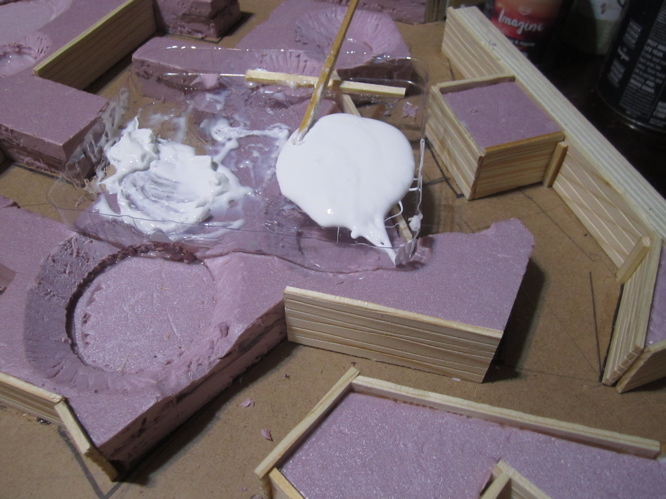 For a bit I thought the goop might not cure in time and I ended up painting the final coats of paint Friday night – the night before the event – AFTER going out and playing the Friday night games at ToonCon. 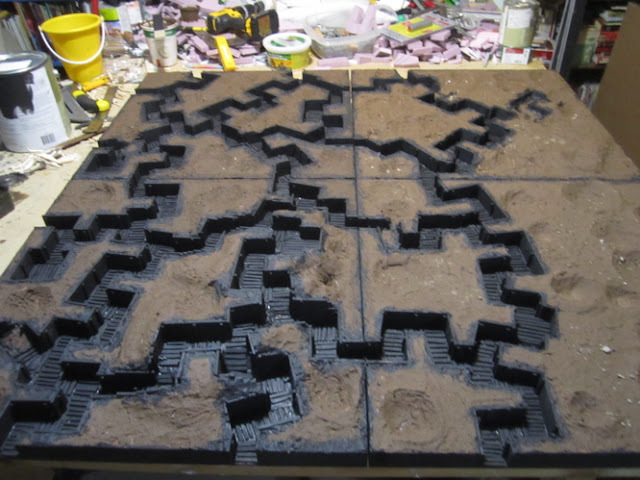 You’ll have to wait to see the pictures of the fininshed project in the next post REGINA TRENCH: The Game! A side note about other preparations for the event. I realized, sometime after I got back from Calgary, that I didn’t actually have any German machine-gunners! 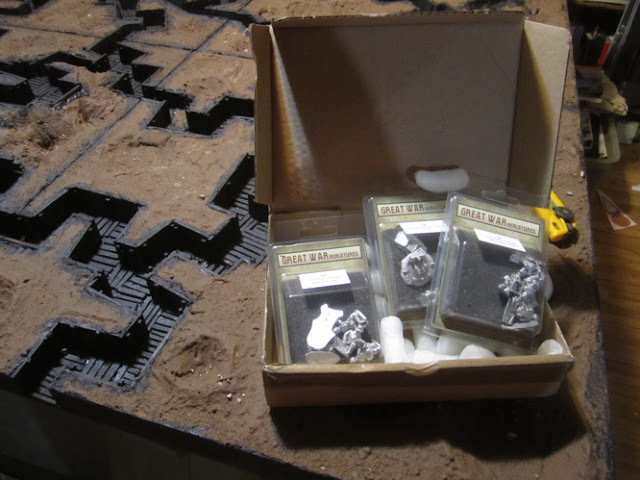 In the previous Vimy game I’d had them all in concrete bunkers and so didn’t actually need MG teams… having less than six weeks I quickly ordered some from North Star Figures as they distribute Great War Miniatures (which are fantastic miniatures!) 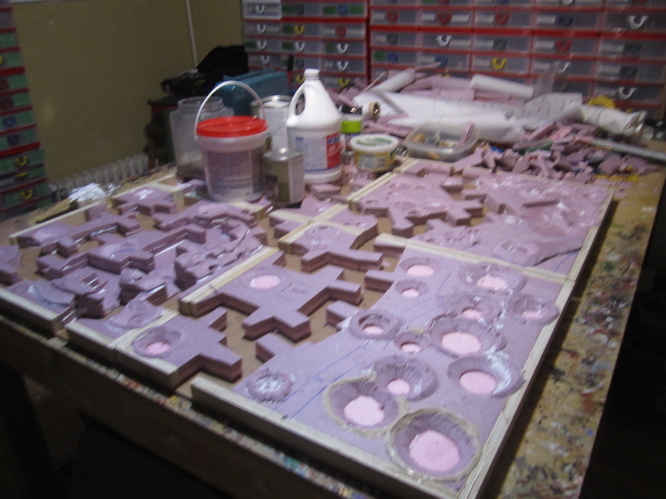 and typically orders I have placed with them in the past took one and a half to two and a half weeks to arrive. But I guess there were busy at North Star because they only just arrived Friday afternoon. 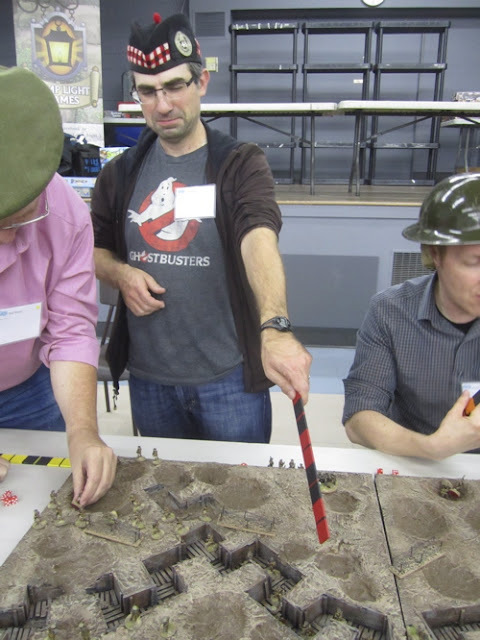 The day before the big event… So I ended up using and Early war team from Renegade Minaitures – which are prone and not even shooting over the gun emplacement –and a German Sailor team – which I borrowed from my East African collection!